Welcome back to Ms. Ballantine’s amazing world of Arykham. It’s been two months since the explosive ending to Spectyr, the second Book of the Order. We discover that our heroine Sorcha has been in a catatonic state since those events, only able to move her eyes and push emotions through the bond with her Sensitive partner, Merrick. Her not-quite ex-partner and ex-husband, Koyla is hanging on to their weak bond, attempting to usurp her bond with Merrick. Raed Rossin, Sorcha’s lover and rightful heir to the throne, is off searching for his treacherous sister, possibly never to return. And Merrick, who is still recovering from losing his first love, has been spending a lot of time with the Emperor’s sister, the Grand Duchess Zofiya. All of this frustrates Sorcha beyond capacity because she cannot take charge of herself, let alone help those she loves. But wait… there’s more! Sorcha’s first partner, Garil, and Raed’s first mate, Aachon, kidnap Sorcha so that she can lead them to Raed. If you are confused… keep reading! The opening of the story is full of immediate and intense action. There is no learning curve in Wrayth, and because of this, I highly recommend reading the first two books before jumping into this one. (Also, this series is one of the best out there and you would be remiss if you didn’t read it from the start.) The book follows our three main characters, Sorcha, Merrick and Raed, allowing the reader insight from each character’s POV. Because all three heroes are involved in their own subplot the story is constantly shifting around, which can cause minor confusion to both the reader and the characters. Also, the heroes feel lost and annoyed, each being on their own, especially since they have learned to work together and heavily rely on their special three-way bond. I was also a bit confused at the beginning, but that was more due to reader issues that the book itself. As I’ve stated in my reviews of the first two books from this series, Ms. Ballantine’s world is an elaborate one, full of rich and intricate details with a unique mythology. The events that occur build upon each other, from the opening paragraph of the first book, to the conclusion of this story. In other words, a lot goes on and one needs to pay attention. Although the author does her best to remind the reader what has happened to date, I was frustrated that I couldn’t remember everything from the earlier books. (I have already decided I’ll be doing a re-read before the next book!) Just like its predecessors, this book is packed with twists and turns, non-stop action and a great deal of story. In other words: PAY ATTENTION! The primary storylines find our three heroes each fighting their own battles. In order to be revived from her comatose condition, Sorcha makes a deal with a geistlord that leaves her (and the reader) a bit uncomfortable (you know it’s going to come back and bite her in the rear!). Raed has been captured by another geistlord, the Wrayth (think creepy version of Star Trek TNG Borg), and he has struck a bargain with the Rossin (the geistlord that shares his body) so that they can work together to survive. Finally, Merrick discovers that a very dangerous man has the ear of the Emperor, but before he can warn anyone is accused of kidnapping the Grand Duchess. I will tell you that for much of the book I felt hopeless. Yet, this is a good thing! I was so caught up in the storylines that I empathized with the character’s plights. I was extremely nervous almost the entire time, and couldn’t put the book down. I’m not going to try and recap more of the elaborate and spectacular plot of Wrayth, but understand that eventually the heroes make their way back to each other, which makes this reader happy, giving me hope again. I also am grateful that many of the loose ends from the previous two books are brought together, giving explanation to much of what’s been going on. The continued character development is so satisfying, and probably the best thing about this series. Starting with the first Book of the Order, the characters and their relationships have always been the heart of these books, endearing themselves and this series to me. They have all gone through so much, with each step adding to the whole. In Wrayth we learn more about Sorcha’s mysterious past, which is exciting in its own right. However, it’s Sorcha’s fortitude and how she reacts to the situations that allow her character to shine. Similarly, observing Raed and the Rossin in action together as they make “deals with the devil,” allows both halves of this man to stretch and grow. Just when you think that maybe Raed has figured out how to live with the Rossin, Ms. Ballantine tosses in a twist that has me worried for Raed. Finally, Merrick, the novice Sensitive takes center stage in Wrayth as her learns he can stand on his own two feet without Sorcha to protect and guide him. In conclusion, there is just so much to love about Wrayth, especially for fans of the series. The action is intense, with a step up in suspense and intrigue. The character development progresses by leaps and bounds. 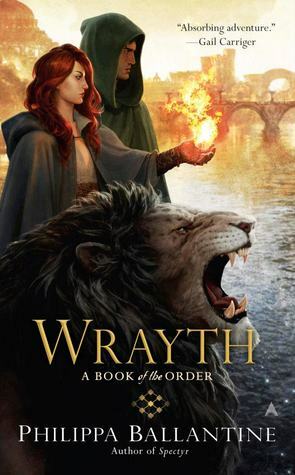 Finally, the overall story arc is peaking, and with only one book left in this series, let me assure you that you will be itching for its release the moment you finish reading Wrayth. Great review! This series sounds wonderful! I like series that make you work for it some, and if it draws you in as much as you’ve said, I’ll happily add it to my TBR’s! !